Perhaps that should be the title for all of this web site. 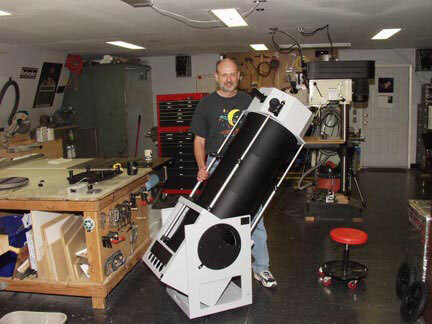 Like my ATM friends, I love building telescopes. Like them, I would spend my own money doing it if folks didn’t send me theirs. That I can buy the materials and have about $15 left for each hour I spend in the shop isn’t bad for doing something I would do anyway. I feel fortunate to be able to do something I love for my livelihood. It’s a fun "business" and I thank all of you who have made it possible. Here's our house (left) and "The Annex" (right) which contains Linda's studio and sewing area upstairs and the largest telescope factory in Wylie, Texas, downstairs. The photo shows the 7", 10", and 14.5". It pre-dates the 12.5". Here’s a close look at the 12.5" GEM Newtonian I finished in 1990. 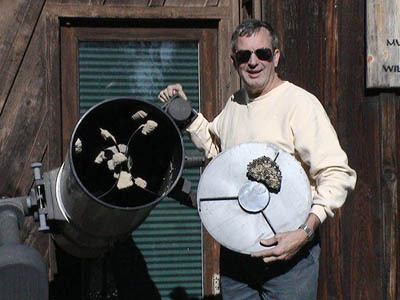 That was the project that led me to the Texas Star Party, Riverside Telescope Makers Conference, the original Teleport, and to making them full time. It''s still on the front porch ready to go, but I haven’t looked through it in many years. It weighs as much as five 14.5" Teleports. They just work a lot better, so the equatorial has become a conversation piece and a home for dirt daubers and paper wasps. 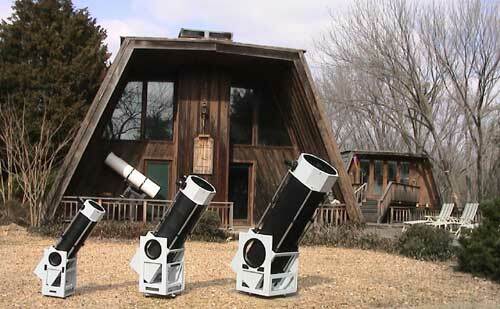 It does let folks coming up the driveway know a telescope nut lives here. The Teleport break room where the staff goes when the boss isn't looking. Please, no emails saying you see why Teleport deliveries take so long. My friend Jerry Bassett helped me move this 10' dome to the cedar grove behind the LTFWT. The dome was surplused out of the White Sands Missile Test Range in New Mexico years ago, and a friend of mine arranged for me to get a good deal on it from another friend of his. It had been at White Sands since the 50's, housing the tracking cameras used to develop our missile guidance technology. The person in charge of that program was Clyde Tombaugh. He spoke at the Texas Star Party in '91, where David Levy released his biography, and showed slides of this dome and a couple of dozen similar ones and told us about his days at White Sands. I was literally on the way to El Paso to get it when he did that. 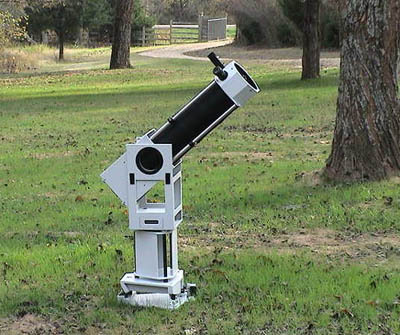 The plan was to fix it up install the 12.5" GEM Newt in it at the club's dark sky site. But the Teleport idea came along on the same trip to get the dome, and I've never found time to do finish it. If that ever does happen, I want to hang a sign over the dome door that says "Clyde Was Here." This is a 14.5" on a Tom Osypowsky Equatorial Platform. At 6' 2", I can reach the eyepiece at zenith. Doesn't it make me look 7' 4"? A 7" is in one of Linda’s cases ready to go to a star party on my Cagiva Gran Canyon. I’ve downsized bikes since the Gold Wing days, and the 7" is a nice fit on the platform I made for the Cagiva. And no, I do not recommend that you carry a scope on a motorcycle. I was all set to go to the new Eldorado Star Party with a 14.5" Teleport on the newly painted Cagiva when a nasty cold and a cloudy forecast for that night made me call it off at the last minute. 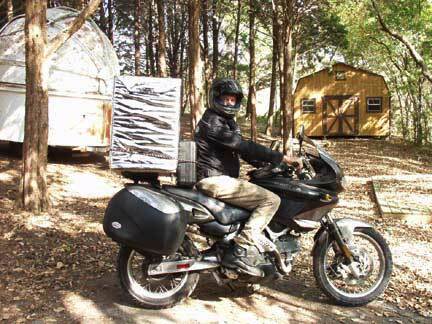 It sure would have been a great excuse for a ride to the Texas Hill Country. After my old computer crashed, I found good deal on a replacement. 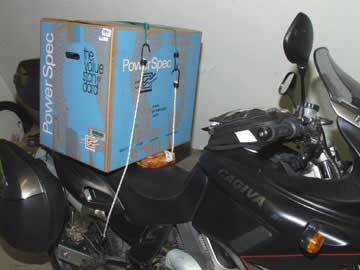 The Cagiva was already loaded and when I strapped it on, there was no room for me. I pulled a turkey breast I had picked up at Sam’s Club from the saddlebag and wedged it under the box to prop it back. I rode home with the turkey sticking out right where I could monitor its temperature. Now I truly know what it means to go "Cold Turkey." Remember, we are professionals! Do not try this at home! I find the 7" Teleport short for me, whether I'm 7’4" or 6’2". The stand helps, but a stand that will fit with the scope in the case leaves the height still marginal for me. The small footprint required for the stand to fit the case also means it needs a rather solid, flat surface to sit on. I had the smallest equatorial platform Tom Osypowsky ever made, for my early 10" Teleport customer John York. I updated it’s top so the new 10" groundboard would fit and put in recesses for the 7" feet. Now I can pick up the whole works with one hand, carry it out and plop it down with the platform pointed north, unlock it and flip the switch and observe. Though I never ran the design through TurboCad, it works well. This is my friend Jerry Bassett, owner of the first 14.5" Teleport. The new license plate on his van seems to say he likes it okay. An interesting visitor showed up at the LTFWT in the fall of ’03 and he seemed to know his way around telescopes quite well. I began to hope he could hang around and help out for a while but he said he had to go back to Wisconsin. I think that’s up north somewhere and I heard they make lots of cheese, beer, motorcycles and telescopes up there. I'll bet it's a pretty cool place, specially in the winter. Seriously, it was a real pleasure to have Dave Kriege of Obsession Telescopes here for a visit. 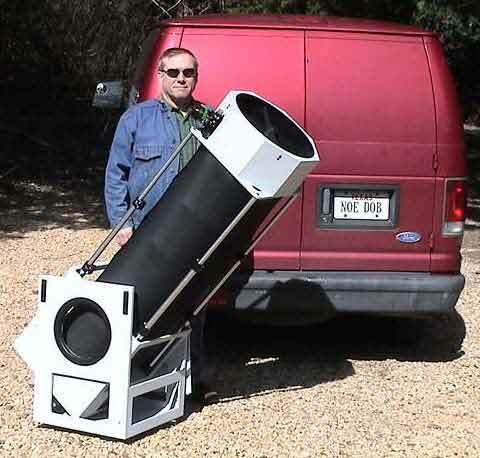 Our mutual customer, Dr. Fred Koch, has many of Daves excellent scopes in use at his "StarWalks" public star parties at Copper Breaks State Park. Dave came down for an Obsession training session with the volunteers who work with Fred and he spent some time here with me and Linda. 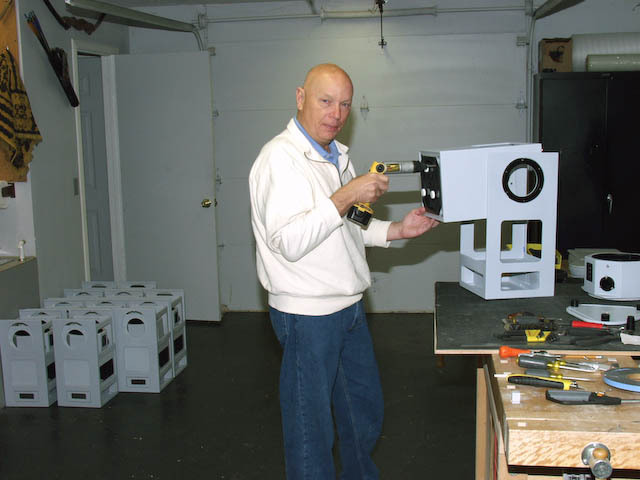 A special overnight house guest and visitor to the LTFWT in the fall of '05 was the astronaut Dr. Story Musgrave. I was completing a run of 7" Teleports and he offered to help. I don't normally let anyone else work on my scopes, but since he did such a great job on the Hubble, I made an exception. A few months ago we took down some old silk flowers that had gathered dust near the ceiling for years. It looked a little bare, and I got this vision of telescopes hanging there where they could easily be lowered and taken out front for observing. After they were up, I realized the source of my mental image. NASA had two of my photo processing machines, and some years ago Linda and I were able to take and in-depth a vendor tour of their facility in Houston. We saw their full-scale model of the Hubble Space Telescope hanging in one of the huge bays. Once the 10" Teleport was up, it became clear I was recalling that experience. While at NASA, we also got to fly the simulator they used to train the astronauts to dock the shuttle with the Mir. I managed to not crash, while Linda greased it in perfectly. 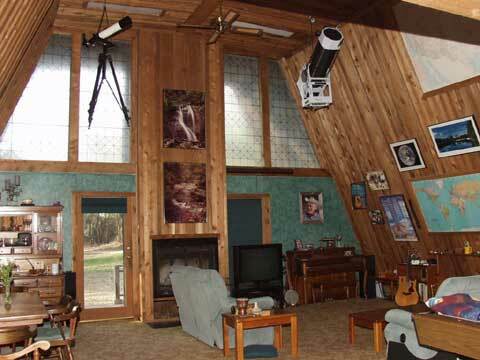 When I look at Al Nagler’s TV101 hanging up there with the 10" Teleport, it reminds me of his work on the optical simulators in the Apollo program. Undoubtedly that was an important step toward the great eyepiece revolution he later wrought and that we all enjoy today. I tend to think the Teleport enjoys having such high class company as Al's 4 " APO. The tall guy playing the Dotar is Chris Rosser, a great songwriter and performer from North Carolina. This photo was made during his second concert here, one of more than 200 we've now held in our living room. (see the last paragraph in "Music" at the end of this section. 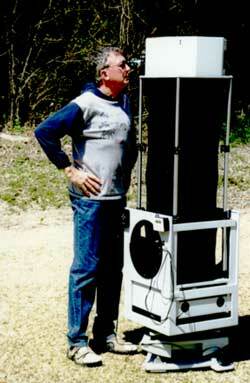 Several years ago, Linda and I introduced the Teleports at the star party in Chiefland, Florida. Just after sunset, a man in a red baseball cap gave an early 10" Teleport a good workout tracking a satellite. After it crossed the horizon, he walked over to me and said "Congratulations. That’s the sweetest moving telescope I’ve ever used. I have a real appreciation for craftsmanship and attention to detail, and you’ve really done it right." But I must say that the complement that means the most to me didn’t come from an astronomer, amateur or professional, but from a source quite close to home. At holiday time a few years ago, my son Kevin came in from Pittsburgh where he was conducting the Duquesne University Symphony. We went from DFW airport to a public star party at a nearby state park. Around 40 people were looking through a half dozen very nice scopes from 4" to 18" that were brought by a local group of serious amateurs. Well into the session, an older gentlemen stopped to look at Saturn through the 10" Teleport. He said "Wow, honey come here, this is just incredible, the best view Ive seen." His wife came for a look, and said "Youre right. Why is it so much better in this telescope?" From a few feet away in the dark a familiar voice said "Because my Dad made that telescope".
. For 40 years Ive written "engineer" in the space for "occupation". I dont have an engineering degree and, truth be told, I've never had an engineering course or even drafting. 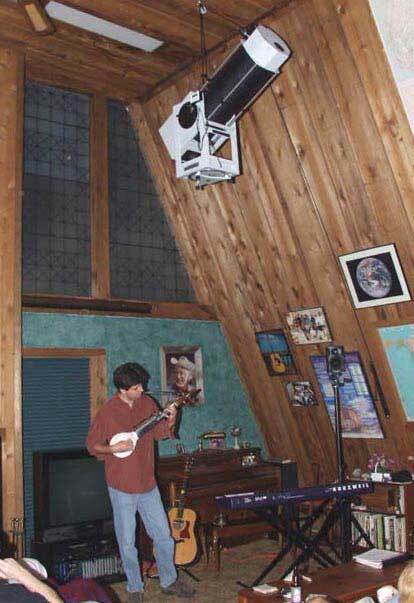 My high school had no wood shop or machine shop, but as a kid I always loved to make things. In college in 1963, I made my first 6" mirror and a pipe-mount German equatorial. It was the most fun I had the entire four years. After I got my BS in physics and math in 1964 Texas Instruments decided I was a "semiconductor engineer." They let me play with some fancy toys that led to several patents and a crisp new dollar bill for each. I supported production processes and developed new ones for manufacturing semiconductor devices. When I finished, I would have a set of specs, and sometimes a patent and another new dollar bill. The mechanical engineers in another department designed and made machines to execute my processes in production (sometimes they wanted to execute me) When they finished, they had a cool machine to watch doing its thing, and it seemed to me they had all the real fun. While at TI, I got very involved in photography and color lab work as a hobby, then got into it more seriously as a side business. When Kodak introduced the C-41 process I made a little unit to let me run it in my home darkroom. Two years later, in 1975, I left TI to manufacture photo-processing machines. With no boss to teach me (or scream at me when I screwed up) over the next 20 years, I learned to do design and mechanical engineering. Now I get to apply that to making telescopes, which is even more fun. So I call myself an engineer on the forms but think of myself as a whittler, hence the Swiss Army knife on the sign in front of the shop. I like to do it all, from concept to product delivery, rather than be alink in a long and complex chain. That limits the complexity of what I can do but it feels extremely free and I find it very satisfying. I like working on something I relate to, and I've related to telescopes for more than 40 years now. I can think of nothing else I would rather design and make. The possibilities for scope design are unlimited. My long term motorcycle addiction has taken me in a direction with the Teleports that seems compatible with travelling light. Overall I tend to be a "minimalist" and enjoy the challenge of fitting the most capability into the smallest space. I found a neat summary of my feelings in a recent email from my friend Roger in Idaho. The optimist says "The glass is half full. "The pessimist says "The glass is half empty." The engineer says "The glass is twice as big as it needs to be." I would literally make everything for the scopes if I could. My experience with the mirror for that 12.5 GEM Newtonian (it took me 17 years) convinced me to let someone else do that. Carl Zambuto is not only a faster optician than me, he's also a better one than me (or anyone else I know.). Likewise the spiders that Bryan Greer makes at Protostar and the finders that Leon Palmer makes at Rigel Systems are better than mine would be. And what can I say about Werner Schmidt's Feathertouch focuser? Talk about engineering . . .
My son, of course, had to become a conductor because I only made it halfway there (a "semiconductor" engineer, remember?). He got his masters in conducting on scholarship at Rice University then spent four years conducting the orchestra at Duquesne University in Pittsburgh. In the fall of 2000 he became the Director of Symphonies at the University of Texas in Austin. He spent four as their youngest and best conductor ever (you may quote me) and he now conducts the Pittsburgh New Music Ensemble (www.pnme.org) I find him as amazing as I do Linda. Speaking of music, we do love it here. I had little exposure to music as a kid and no innate talent at all. I've always had trouble telling one note from another. With great difficulty, I began banging on a guitar right after college when I got inspired by the 60s folk wave. Linda has a fair level of talent, (especially for an engineer) and she plays guitar, keyboard, and cello. The cello was one of the many things that led us to fall in love in 1995. My good friend Bill Nash and I had worked up the Harry Chapin song, "Mr. Tanner." We performed it first in public at a party at a friends house and Linda was there. I was immediately smitten and when I found a few days later that she played cello and was an engineer, I went right to work. It turned out to be easy, because Linda liked me too. She found out I was doing house concerts in my living room, came out for one, and stayed. We were married Nov 5, 1995 and it’s been a wonderful eleven years. One day a stranger knocked on the door and she answered. Looking at the sign on the porch he asked "Are you a wayward woman?" She said, "Well, I was, but I married him." April of 2007 saw the fifteen-year anniversary of Acoustic Concert Tours, the house concert series in our living room. With our partner, Paul Porter, we've now hosted more than 200 concerts. About once a month we have a touring singer/songwriter from somewhere around the country stop in and play a concert in our living room. We usually have an audience of around 20 or 30, but have had as many as 95. Folks "donate" $15 each to the performer, bring snacks and drinks to share, and we have a wonderful time. It's all about the songs, which are generally way too meaningful to ever hear on the radio. It’s called, "Acoustic, Folk, Americana," or whatever. I tend to call it "hard listening" because the lyrics really have something to say and you need to pay attention. We've gotten to know many wonderful people through the concerts, especially the folks who write and perform these seriously worthwhile songs. If they aren't too difficult, I try to steal the ones I find most important to me. Some of those actually bring in ideas that deal with astronomy and the conflict between religion and science. Included would be two by Peter Mayer, "Everything is Holy Now" and "Do You Really Wanna Know?" Another from Ellis Paul is "Did Galileo Pray?" An amazing songwriter named Dave Carter (in my opinion the greatest since Harry Chapin) played three concerts here with his wonderful partner Tracy Grammer over a two year period. Out of a philosophical conversation we had at brunch here he wrote an incredible song "The Gentle Arms of Eden" and dedicated it to me and Linda on their album "Drum Hat Buddha." It became album of the year and the song #3 for the year on Folk Radio nationwide for 2002. Dave and Tracy had been touring with Joan Baez and their career was going straight up when Dave died of a heart attack at a festival in July of 2002, two weeks before his 50th birthday. Not just a great songwriter, Dave was one of the finest people I've ever known. You can see photos of past performers and the schedule for whos coming to play in the coming months.